Hi everyone, after struggling for many years with useless courses teaching you patterns and setups, I came across with Ben's website and bought his enhanced course and that was the "aha" moment. His approach is so simple that I could not believe it, he is like the Yoda master of forex, I'm not kidding, he knows his craft and if you really want to learn how to trade profitably, this is the man. Ben is an honest and patience man, I will answer your questions and explain to you everything you need to succeed in this business. So if you have not learned how to trade forex, Ben is the man, this is your last stop !!! I want to give thumbs up to Ben for his courses. I have been working with him now for about 5 months, and for the first time in 10+ years I can say I finally have a working understanding of what makes the markets move, and more importantly how to trade them. I'm up significantly for the year and expect to continue. The great thing is, if I do hit a roadblock, I can the help I need to overcome the obstacles. Ben will be there for you as he has been with me, and will help you as he has helped me. His teaching is clear, concise, and effective. Don't confuse simple for ineffective, I have been through many technical courses that were loaded with pages of content, all sorts of videos, hours and hours of stuff that in the end left me frustrated. Ben cuts through the BS and gives it to you straight. Most importantly, WHAT HE TEACHES WORKS. If you want to really learn how to trade, this is it. Highly recommended. I started with Ben after several years of up and down trading, switching systems and looking for the right approach to take my trading to the full time level. At first glance, the approach seemed so simple, yet as I look back after 6 months in his private coaching program, I have been profitable 3 out of the last 4 months and he has helped me clean up some bad habits that I know plague many traders. One Great feature with the private coaching program is Ben continuously follows up with you even after the course material is shown. I don't know many mentors that would touch base with you every week if necessary to ensure you are on the right track, and someone that answers any questions freely and openly to help you on your quest. I really feel like Ben is more than just a mentor in this, he becomes a partner in your success. I look forward to continuing my progress under Ben's Private coaching program and following in his footsteps to build a successful trading business as he did. Many thanks Ben. After wasting thousands of pounds on forex education that didn't meet my expectations. I finally found Ben Nathan, who has transformed my trading completely. He is a great teacher and explained everything so well that it is impossible not to understand. I am dyslexic and knew nothing about fundementals. Ben Nathan Is A Great Teacher, Trader and Mentor! 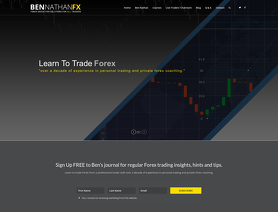 Ben Nathan is the real deal if you are serious about trading Forex! I have several of his courses, each of which has added a new tool to my Forex Arsenal (one method for long term trades, one method for day trades, etc.). He has turned my trading around so that I'm consistently profitable each month (with only an occasional small monthly loss). I understand each day, what pairs to trade, why I'm trading them, logical place for stop loss and take profit, etc. However, if you are not succeeding in Forex you must ask yourself the following questions: am I adhering to the methodology, am I taking my stop losses when they are hit, am I taking profits when I should or am I taking profits off the table too soon, am I exercising proper money management. If you are not doing all the above, NO trading method or trading mentor will solve your problem and you will eventually quit, believing that the whole thing is just a scam! I don't mean to sound harsh but I speak from painful reality. Ben is honest, a man of integrity. Even though I have several of his courses (and I'm currently in a one-on-one mentoring relationship with him) he has NEVER pressured me to by a course, upgrade to something bigger and better, etc.) Ben's reputation within the professional Forex industry is stellar as well! Whoa! My initial intent was to give a review for Ben’s services. It seems to me that there have been some negative reviews. It is only fair to say when it comes to trading the forex markets, the trader (you) needs to take 100% responsibility for your results. Psychology, is the very first thing that I have learn about any trading market, it is paramount to my success in trading! This is the very thing that attracted me to Ben’s services. His introduction to his services is very clear about this. Ben has never ever pressured me as a subscriber to do more or buy more of his services. As a current member of his service, I have asked him via email to take his private coaching, (Of which I will be doing in the near future), he advised me to take time to learn more about myself as a trader and the markets. I appreciated his candor. He could have sold me the moon. His ethical approach and honesty keeps me an enthusiastic forex student. I continue to learn each day, through his daily Live Trading Room, and Trading Signals. As a newbie, understanding the markets can be confusing. Ben is here to decipher its reactions. Combined with his interpretations and understandings of the markets, and his daily analysis, it is easy to follow his professional experience. Still confused, just ask, Ben will give his impression and reasonable possibility as to why the markets are reacting. For me, this has calmed my trading behavior (psychology). However, it is up to me to decide if the information I am receiving is valid. Trading is not a joke. This is what is taught here. I fully recommend Ben’s services. His services are teaching me to think on my own. “Give a man a fish and you feed him for a day; teach a man to fish and you feed him for a lifetime”. I am very happy with the service Ben provided. I would recommend his method to anyone who is interested in fundamentals which really move the market. Ben is a great mentor and his way of trading is very simple, straight forward and very suitable for beginners and intermediate traders. The private sessions are insightful but nothing too crazy complicated that you would not be able to digest fast. He covers both fundamentals and technicals so after you complete the first 3 sessions, you would be able to start trading right away. In terms of scheduling the sessions, Ben was very flexible and did his best to meet my requirements of when to make the calls. What made the whole experience fantastic is the fact that Ben has been available for questions on Skype all the time, so my advice is to not shy away from asking him everything that you want to know as I'm sure you would receive comprehensive answers. I was very satisfied with what I was provided with, thus I'd more than happily recommend his services to anyone who is looking to enter the FX markets. I recently started Ben's mentorship program and my account and trading behavior has turned around on the positive side. Ben has excellent material and his method is simplified and thorough. He is patient and passionate in his teaching and explains his method completely. I would highly recommend his training and mentorship to anyone.